In my mind, the question is not whether to write a guest post or not, but how, where and when! Once you've been blogging long enough to have networked with a good number of bloggers, and sorted out any glitches on your site, you're ready to start guest posting. 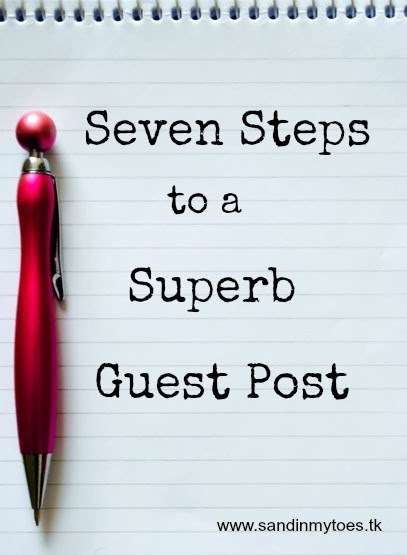 A guest post is a win-win situation for the host and the writer - the host gets new content and the writer or blogger gets exposure. A lot of people remain unconvinced about it because they feel like they are 'giving away' their content. That's not the way I'd put it because, one, your name will be attached to the content wherever it is published; and two, you can extend your reach far beyond your blog. Many bloggers also believe that they should only get published on the 'big' sites - the ones getting millions of pageviews. Good luck with that waiting list, but if you can get your content published on any other blog that you can relate to, consider it a victory. In this age of Google Plus, the more you spread out your writing, the better it will be for your blogging career. Offer your host at least a handful of topics you can write on. This way, they can tell you what suits their blog's theme and subject. In fact, the host may offer their own suggestions. Work together to decide on a topic that you are confident writing about and they would like to publish. Remember, the guest post should benefit both of you, so if you are not keen on writing about a particular subject, let the host know upfront. After all, it is your name the post will be credited to, and you want it to be among your best work. There may be some guidelines the host provides you with about submitting your post - such as the post's length, format and type of images. Follow these as closely as you can. Every blogger has a certain visual style, and you wouldn't want them to spend too much time trying to amend your post to fit in with their blog. We all have a 'voice' when we write. You could call it a writing style that identifies you and your blog. You will also have a set of regular readers who understand your style. But when you are writing for another blog, it's a good idea to find out more about what it's readers are like. After all, you are writing for them! You can do this by checking out what posts are popular and reading some of the comments. Avoid making too many references to what the readers may not know about you. Keep your post simple and straightforward. You may link back to one another post on your blog if you think it's relevant, but not more than two. It's also a good idea to link to a post on the host's blog - it creates a sense of familiarity for the reader. And don't forget to reply to each or at least, most comments on your guest post. You may double-check your post before publishing it on your blog, but with a guest post, you have to be completely sure. Check your spellings, facts and links again and again. The last thing you want to do is bother your host to make changes to the post after it's been published. Make an effort to find the best pictures to go with your post. Whether you have to find them online, photograph or create them, choose the best. Good visuals will create a strong impression and get attention. Your post will be shared on more profiles than usual, so you want it to look fabulous. Don't forget to provide the photo credit, if applicable. Watermarking your own images is also a good idea. You don't always have to use a standard bio. As I said, understand the host's blog and readers, and choose your words accordingly. Don't go overboard - try to limit your profile or bio to 300 words at most. Needless to say, use your best profile photo. Ideally, use the one that's on your blog. 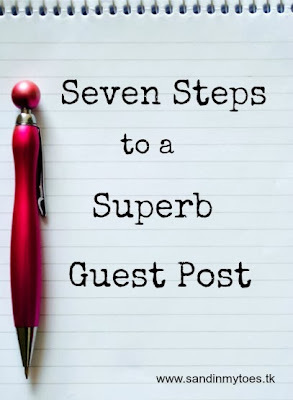 Don't leave the burden of publicizing your guest post entirely on the host. Make sure you share it as much, if not more, than you would a post on your own blog. Tag the host for good measure, and also to reach their audience. If all goes well, you should have made new friends and readers along the way. You can also ask the host to write for your blog some time - they will appreciate the offer. How has guest posting helped you as a blogger? I've done five guest posts so far, one for a bigger outlet and four for other mom bloggers like me. It's funny that you mention the bio. I have found that writing a compelling yet brief bio is the hardest part of writing a guest blog! Yes, and the bio can make such a difference to who visits your blog!